NetSuite is a fully integrated cloud-based business management platform within which you can manage all aspects of your business. The software is hosted in the cloud, removing the need for expensive IT infrastructure and overheads. NetSuite's use of a single database for all your data provides you with a real-time, 360° perspective on your organisation. Real-time business intelligence, personalised for every employee. Accelerated business processes, from order management to procurement. An integrated suite, eliminating manual processes and reducing errors. A complete overview of customers across sales, marketing, service and finance. Reduced IT costs and automatic upgrades. Cloud-based data and services accessible from anywhere in the world via a suitable web-enabled device. ERP, CRM, SRP and eCommerce in a single, fully-integrated business management software solution. Utilising the power of NetSuite OneWorld, you can have all of NetSuite's amazing functionality across multiple subsidiaries. For more information on NetSuite OneWorld, click here. NetSuite's SuiteCommerce functionality enables you to have real-time inventory levels, system consolidation, and seamless integration between business processes that were previously separate systems. To find out more about SuiteCommerce, click here. NetSuite's Global Enterprise Resource Planning capabilities are without equal, allowing you to manage your order processing, stock management and accounting within one system. NetSuite enables you to perform tasks that are beyond the scope of lesser ERPs. To find out more Global Enterprise Resource Planning, click here. Customer Relationship Management lies at the core of business success. See how NetSuite's advanced CRM gives you a global overview of your entire sales force. 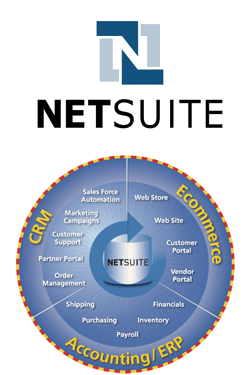 To find out more about NetSuite CRM, click here. Manage your worldwide professional services team within NetSuite utilising the latest project management and advanced billing features. To find out more about NetSuite SRP, click here. Enabling Solutions Stafford is a not for profit social enterprise. Limited by guarantee, and registered in England and Wales. Company number 08542663. Enabling Solutions Stafford © 2013 - 2019. VAT Number: GB164884078. All rights reserved.